Wholesale suppliers and exporters of Myrrh Oil, Myrrh Gum, Myrrh Gum Resin and Frankincense Myrrh. A small tree which is the source of Herabol myrrh. The gum resin exudate from wounds in the stem is pale yellow at first and later solidifies to brown-black. Indigenous to north-east Africa especially Somalia Island, Collected in Saudi Arabia, Abyssinia, Iran, Thailand and sold in India bazaars. the oil of myrrh was reported to contain 1-pinene, cadinene, limonene, cuminaldehyde, eugenol, m-cresol, a tricyclic susquiterpene hydrocarbon acetic acid, formic acid, and some other unidentified sesquiterpenes and acids. Myrrh is used in perfumery, mouth washes, Massage, diffuser, denifrices and in religious ceremonies as incense. Because of its ability to preserve the flesh myrrh oil was used as a cosmetic ingredient. It is reputed to reduce wrinkles and preserve a youthful complexion. Egyptian women used myrrh in their facial preparations. It has a slightly cooling effect on the skin, and so would be especially useful in a hot dry climate. It has been used since ancient times to prevent ageing and rejuvenate body and mind, it is very specific for skin diseases. This is reported to be used by ancients for embalming. Gum is stimulating, draining, purifying, toning, moderately warming. It is noteworthy that frankincense and myrrh were offered to Jesus Christ in his infancy by the Eastern Sages. It is also used in athlete's foot, coughs, cuts, eczema, irritated skin, mouth and gum infections, ringworm, scanty periods, weeping sores and wrinkles. It promotes the growth of new tissues, cicatrizes sores and wounds, calms pain. It is an important rasayana. It is specially valuable for wounds that are slow to heal, for weepy eczema, athlete's foot, ideal in skin creams for deep cracks on the heels and hands. The Egyptians used oil of myrrh for embalming, and later on their priesthood discovered other ritual, medical, and cosmetic uses. The world trade in such scents from nature has never declined since that time. The gum is bitter, acrid and astringent, acrid after the process of digestion, thermogenic, digestive, carminative, expectorant, intellect promoting, aphrodisiac, anthelmintic, depurative, anti-inflammatory, diuretic, sudorific, deodorant, ophthalmic, antiseptic, stimulant and tonic, and is useful in vitiated conditions of vata, pitta and kapha, stomatitis,dyspepsia, heminthiasis, amenorrhoea, dysmenorrhoea and other menstrual disorders, bronchitis, asthma, phthisis, ophthalmia, spongy gum, pharyngodynia, rheumatoida arthirits, sciatica, wounds and ulcers, inflammations, strangury and skin diseases. Myrrh had many uses, in ancient Egypt and in modern aromatherapy. Then, as now, Myrrh was indicated for healthy gums. Papyrus scrolls dating back to 2800 BC describe the use of many medicinal herbs, fine oils, incense and perfumes; gums and oils like cedar and myrrh were used to embalm bodies. The journey celebrated by all Christians recounting the birth of Jesus is also believed to have begun in these parts. The Bible wrote of the three wise men who brought gold, frankincense and myrrh to the manger in Bethlehem where Jesus was born. Myrrh is one of the few essential oils whose fragrance is said to improve with time - so, age it well. However, be aware the oil can become gummy and sticky possibly due to polymerization. 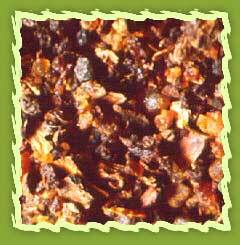 The efficacy of myrrh for the treatment of chronic wounds and ulcers is legendary. This is due to its antiseptic, astringent, anti fungal (blended with tea tree) and anti inflammatory properties.